* What do you own? * What do you want to trade? "With the magic of iOS we built in an email feature to generate an output of the items that you own, want, and trade," explained Craig Caruso, CEO of New York based CarusoApps. "Feature releases will include social media sharing and use logins but for now we want to keep it simple. The release date of the app is 9/23 to go hand and hand with the game launch at all major retailers. Please spread the word! We're trying to get this application into the hands of parents and kids to track and share their collection! If you have any suggestions please let us know so we can make any corrections if needed. Special Thanks to Mikey B and Matt S for assistance in building this app for our Infinity Checklist community!" 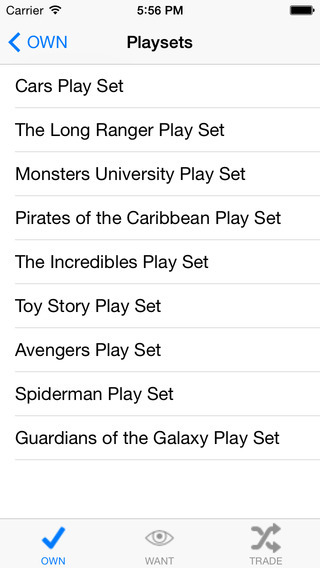 With the ever-expanding Disney Infinity game universe CarusoApps is pleased to release this app with iAds for Free. Infinity Checklist 1.1 is available worldwide exclusively through the App Store in the Reference category. Located in Staten Island, New York, CarusoApps specializes in Mobile application development with the capacity to meet any size needs. Copyright (C) 2010-2014 CarusoApps. All Rights Reserved. Apple, the Apple logo, iPhone iPod and iPad are registered trademarks of Apple Inc. in the U.S. and/or other countries.